“It is vibrant, full of passion, full of life. Welcoming and warm,” explains Project Coordinator, Lisa Gibson, “I leave Nigeria with hope.” These reflections juxtapose awkwardly with the country’s development indicators. $280 billion oil revenue have flowed into the country over the past 30 years, yet Nigeria ranks 158th out of 177 countries on the Human Development Index and has a GDP per capita of US$1,418 in 2008. Despite being one of the world’s main oil producers, 54 percent of the population lives on less than 1 dollar per day. Truth is, Nigeria is a tough place to live. It can have a depressing effect for visitors, when they see how little of that oil revenue and other aid support has translated into public services for the vast population. The country remains an interesting case study regarding how money alone cannot support a country to move out of poverty. Why then are we so hopeful in a context that, upon first glance, does not seem to warrant it? Well, to start with, if you would visit just about any country in the world, and within the first five days meet with 40 emerging leaders that are committed to their country’s sustainable development and well-being, you too might leave moved. These people defy the stereotypes of an Africa that is destitute and conflict-prone, and instead tell another story of hope and potential. We are working in Nigeria with the Canadian NGO One Sky on the Leading From Within—Integral Leadership for Sustainable Development project, funded by CIDA and designed in collaboration with Drishti - Centre for Integral Action. Our view is that we need a quality of leadership that is able to address and respond to the increasingly complex issues ahead of us. 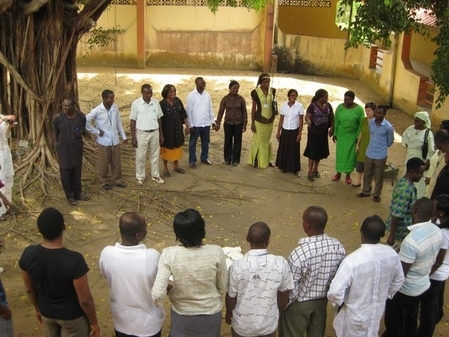 The purpose of One Sky’s project is to work with 30 emerging leaders in the NGO field for the next three years to develop their capacity to be leaders in the area of sustainable development—meeting the complexity with new mental models, core competencies, and an ability to hold multiple perspectives. Within the first five days, we interviewed 40 of the 60 applicants, and selected 33 as participants in the project. The following week, we held our first four-day retreat-workshop. Based on an integral framework, the leadership curriculum encourages participants to look within and to develop their interior capacities for self-reflection, perspective-taking and interpersonal communication, as well as the exterior capacities, including, stronger negotiation skills, more effective project management, and more efficient and ethical financial management. Developing the self along the way to working towards sustainability, participants will be asked to tangibly apply their learning to breakthrough initiatives with their organization that achieve real and lasting change in an area that they previously thought could not be done. But, before we go on to describe how we are attempting to reach these goals over the three-year project, let us first give a bit more on the context. Nigeria is an intense place. We are located in the extremely humid and hot city of Calabar, in southeast part of the country near the Cameroon border. The state-supplied electricity flicks on for a brief 40min each day and then flicks off, leaving many in darkness, unless you are wealthy enough to pay for a generator and the diesel to run it. The mode of communication here is fiery. Nigerians speak directly and candidly, telling you exactly what they feel, think, want, etc. and expect that you do the same. While this can be intense, it is a refreshing change from the Canadian niceties we are accustomed to. The wahalla is a local term used to describe a situation where tempers flare up and loud words are exchanged. Usually, these wahallas burn out as quickly as they ignite, and friendships are immediately and deeply re-established. Nigerians are simply not shy. They are not reserved. They are direct, animated, powerful and warm. They engage fully with life, …and they engaged fully with the One Sky workshop. During the four-day workshop, there was intense laughter, there was the heated discussions and impassioned speeches that are all part of regular communication. There were times when the energy felt as if it were going to burst out through the concrete walls of the small air-conditioned room, as people excitedly exchanged exclamations of approval, disapproval, disagreement and voracious agreement. People participate with such openness, and a kind of vulnerability that is expressed even within the power of their words and statements. Over that first workshop, we began to realize that the intensity so distinctive of Nigeria also extended to how these emerging leaders manifest their care and concern. These people bring their care into action in various ways—such as doing award-winning community forestry work, developing policies for gender equality, advocating for renewable energy, contributing to good governance, supporting orphans and vulnerable children...and the list continues. In hearing the depth and power behind their care, we couldn’t help but notice that it is fairly easy to be an advocate for sustainability in North America or Europe, where one’s material needs are already met and one is not needing to be overly concerned about daily survival; it is quite a different matter when one places their commitment and energy toward sustainability when those aspects are truly held in question. This energy and passion of the participants is clearly seen in their life stories. There is Robert, a 23 year old who wrote a book called Youth Know Thyself during his undergraduate degree and has since started an NGO of the same name that aims to empower the youth of Nigeria to more deeply know themselves so that they can more fully serve their country. There is Nneoyi, a man who formerly was involved in political thuggery, one of the central issues that keep this country’s democracy unable to address corruption, to make policy reform stick, and to arrive at good governance. Formerly, he was paid by different politicians to engage in acts of violence, stealing of ballot boxes, and various other threatening methods to overcome opponents. While leaving such a lifestyle is almost unheard of, Nneoyi was inspired to leave his life behind a few years ago and is now committed to working towards good governance and ending corruption through his work with civil society. 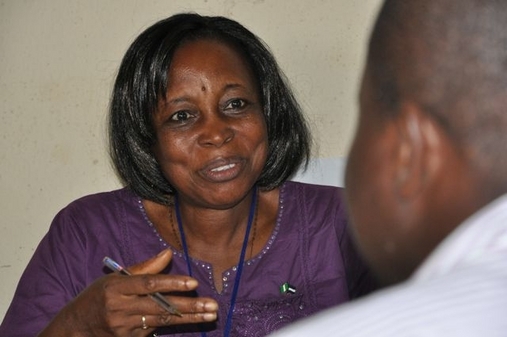 There is Mary, a lawyer who, in addition to running her own NGO that supports sustainable livelihoods, works tirelessly to bring gender awareness to Nigeria, including being involved in changing the property laws so that women can now inherit property. There is Obio, from a small rural village in the jungle who works for a conservation organization, and whose eyes simply light up when speaking of his love for nature and for the monkeys that live in Cross River State’s rainforest. Another participant, Chief Edwin, took us to his village of Ekrui after the retreat-workshop. 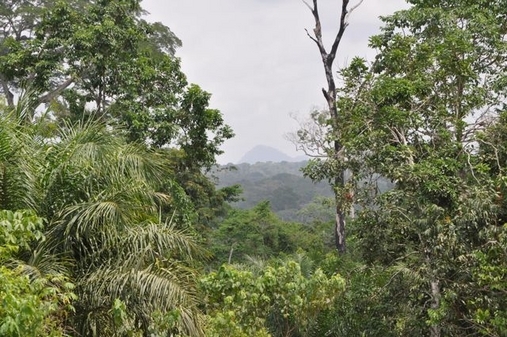 Ekuri is located in the forests in the buffer zone of Cross River State Park. Despite being an isolated village, with adobe huts, no electricity, water that is collected from a nearby stream, and no health care services, the community leaders had a vision since the early 1990s for a community forest. Since then, they have sought to protect their rainforest, developing a community forestry plan with technical support from Canada, and implementing this vision of how they could live off their forest in perpetuity, rather than cut it down for immediate gains. Chief Edwin’s story speaks not only of his personal commitment and capacity for engaging multiple perspectives in his village, but also of the hope for visionary leadership that can arise in conditions that might seem unlikely. Ekrui Initiative has won a United Nations award for its community forestry work, becoming a model for other villages to follow. This is the quality of leadership we want to further support in this region of Nigeria. Advice in international circles suggest that supporting these emerging leaders and the civil society they contribute to, is an effective move toward sustainable development. In the case of Nigeria, the civil society’s voice to advocate for good governance, ethical policies, economic reform, and sustainability is just getting established. One reason the government has been able to operate with such poor governance and high corruption is that there has been no reason not to. If the inherent drive toward ethical social change is not yet present in the country’s politicians, then pressure from the outside becomes very important. In other countries in similar situations, change happened as the civil society became organized to put pressure on the government to clean up its act. So, there is good reason to focus on these individuals, and their growing coalitions and movements, to create change from within Nigeria. So the question is: how are we going about this leadership development project? How are we intending to foster this quality of leadership, able to directly meet and engage the complexity of our times? We are challenging the participants to look within to understand more deeply their vision for their work and how they might more effectively work towards it. “Leading from within” is the project title, both to draw leadership from our deepest recesses of being, as well as to find and hold up the leaders within the country of Nigeria, so to support lasting change. That is, to reverse the brain drain that can be so ubiquitous in Africa. Anchoring this inward focus to practical reality, the program combines rigorous capacity building on leadership skills for a global leader today. At this first workshop, for example, participants learned active listening, presentation skills, and how to map the complexity of issues using the Four Quadrants of the Integral Model. These various skills intend to develop certain intelligences, or developmental lines, that help leaders today to understand and engage complexity. In the above example, these relate with the interpersonal line, self-identity line, and cognitive line. Other workshops will further engage the interpersonal intelligence with debating and dialoging skills with multi-stakeholders, the moral line with exercises to foster worldcentric awareness, and the cognitive line with exercises to hold multiple perspectives, as well as provide technical training on improved project management, policy dialogues, and media relations. As is the custom here, we opened and closed each day with a prayer led by one of the participants. While this would seem strange somehow in a Canadian or Western context, it felt natural at this workshop, and seemed to open everyone to a larger purpose of why they were there and from where the inspiration of their work flowed. It somehow seems easier to not need spirit in a context where suffering and death are much further removed. But, in a place where life is so much more uncertain—where roads are terrible, the driving risky, the electricity hardly runs more than 1hr per day, hospitals are few and expensive—there is good reason to align your self with the deepest Source you know. There was something too about the causal state—beyond petitionary prayer—a real connection with Godhead that seems to be experienced by some, maybe many, that created a sweeter space in which to work. Perhaps unlike other truly secular NGOs who tend to only tolerate an opening prayer, we would hold that spiritual thread throughout the workshop. In this way, the simultaneous turn inward towards self and outwards to an expanding sense of care seemed to be naturally co-created in this learning space. One day two of the workshop, we filmed a three-minute video of each participant presenting him or her self, his/her work, and purpose. This was first and foremost a fun way to begin the leadership project, bringing people together through the challenge of the exercise itself. Our intention is also to upload these videos to the internet to serve as conduits for the world to get to know each participant. However, this exercise also served as one of several self-assessments that help us know where people are at, as well as to serve each participant to get an objective view of themselves (an outside view of their own interior experience). This, among other assessments, will help us to better align and design the leadership project to be most useful along a developmental trajectory. Too often, leadership programs parachute in from another context and worldview, and while much money might be spent, the design is not able to connect with people’s existing way of being, and so these efforts struggle to effectively contribute to the next emergent stage of leadership. This developmental aspect of our project is the central thread, and we see it to be unique and important in the effectiveness of this three-year project. Over this first year, there will be three more retreat-workshops, in June, August, and November, during which the curriculum will be rolled out and deepened. Throughout the interim periods, the participants are working in smaller 3-5-person learning communities, with whom they will be meeting and dialoging on certain topics. We hope these learning communities can help to embed learning in practice, as well as contribute to individuals finding and engaging their growing edges together. By November, we will start one-on-one coaching with some integral coaches from the Integral Coaching Canada program. At this time too, each learning community will begin to develop their proposed breakthrough initiatives, which will be given seed funding and will be another way that learning can be applied to sustainable development. Explaining this with terms from Integral Theory, we have included the domains and perspectives of “I”, “We”, “It”, and “Its” (or experience, culture, behavior and systems), as well as have sought an alignment of the project with Eros, the inherent drive of the universe towards greater complexity and depth. We are building on many years of experience in Nigeria and we know the Integral Framework provides additional insight into how best to design and deliver such a project. However, we also know that there is a lot we don’t know. And more, there is much we don’t yet know that we don’t know. To help us with this, we’ve formed a truly stellar Advisory Committee made up of Ken Wilber, Diane Hamilton, Sean Esbjorn-Hargens, Laura Divine, Karen O’Brien, Terri O’Fallon, Emine Kiray, Paul van Schaik, as well as Jennifer Otoadese and Tunde Morakinyo, the latter two individuals are highly regarded by all sectors in Calabar, from forest villagers to social change agents to corporate heads to public officials. This advisory will help us with the finer nuances of a complex project. We also welcome your insights and support; if you want to help out, contact us. The greatest insight from our work in Nigeria so far is how the perception of Africa as a continent of destitute poverty, the HIV/AIDS pandemic, violent civil wars and devastating environmental degradation, is only one side of the story. The other story to be told is that there exists a multitude of amazing individuals and effective organizations who are doing inspiring work and defying the stereotypes that prevail. This brings hope to Nigeria, as well as to the continent. Learning more about the intermeshed issues of governance, ethics, consciousness, and economics, we can see that there are clear reasons why certain countries are stuck in poverty. With a way of making sense of these tangled issues using the Integral Framework, we can also see potential ways out of this situation. Along with the emerging leaders in this country who are working for change, against all odds presented by the life conditions, we believe that we can work meaningfully to create a more sustainable tomorrow. We leave Nigeria inspired—not naïvely so but grounded in the leadership potential already emerging, to which we intend to support as fully as we can. One Sky has just released a new video on its integral leadesrhip program in West Africa!